I don't propose to go into what happened on the board here (since Jonathan will be discussing the end of the game on Monday). What I want to mention is that while this was a moment of high tension, it's not at all clear how long that moment of tension was. If you look at the times given on Chess24, they suggest that Howell, pondering a wide choice which included 42. Ke2, which probably wins, and 42. Rd5, which he played but probably does not, made his selection in less than a minute. 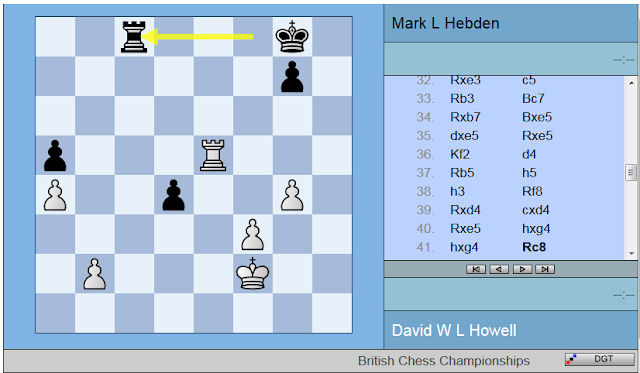 However, people watching on Chess24, or on the championship site, in real time, experienced a gap of about half an hour between Hebden's 41st move and Howell playing his 42nd. Which makes it all the more odd that when the moves did start coming up, the gap between the two should be recorded at less than a minute. Now it's true that David Howell has a somewhat eccentric approach to time management, and it may very well be that what appeared to happen - that for move 42, he thought for almost half an hour, until he had only two or three minutes left - is really what happened. There must have been plenty of eyewitnesses, and if any of them would like to tell us, we'd be obliged. But in the first place, I'm not going to be convinced of that unless I do get an eyewitness account and in the second place it makes a nonsense of the Chess24 times if it did happen that way. But in the third place, given that it was a disastrous event from the point of view of live transmission, with boards freezing, or never being displayed, or finishing without the results being shown, all over the shop, the main reason I can't be sure that what I saw happening is really what happened is that by the end of the event nobody watching had any confidence in the live transmission at all. I'm not seeking to apportion blame for this and I'm certainly not telling anybody anything they don't already know. But it's a whole bunch of no good if it's like this, because you can't be inviting friends, internet acquaintances, chess fans from elsewhere or anybody to watch our event if, at the very climax, everything stops for half an hour and you can't be sure that this is really because a player is using up his thinking time. Of course it always used to be this way - when live internet transmissions were a novelty, and for that matter for a few years afterwards, every time I'd try and watch the last round of a tournament, everything would freeze right at the vital moment because of all the people frantically logging on to watch the finish. It used to be as if there was a power cut fifty metres from the tape every time you were watching a race at the Olympics. But that was years ago now and everybody's expectations are a little bit higher. The IT has to be reliable or we can't invite our friends to watch. It's as simple as that. In the mean time, congratulations once again to Jonathan Hawkins. After he won I spent a few minutes looking for his book, Amateur to GM, before it dawned on me that until recently he was only an IM - as if "only" was an appropriate term, given what he's achieved. It seems only yesterday that he was a club player like the rest of us. On the Howell-Hebden game - as far as I can tell Howell did take a huge chunk of time after the time control. The problem was how the extra 30 minutes was added to the official PGN. It wasn't added on move 40 - so clocks at chess24 got down to 0 - but it seems they later fixed it (maybe you can do it manually in the DGT software) on move 42 or a similar moment. Our software then picked up the new times from the PGN, but it seems it couldn't work out the time that had been taken for the moves properly. A more significant last-round moment, perhaps: The live PGN initially had 26...Rd4 as the last move in Hawkins - Arkell. Then a few seconds later it changed to 26...R5d7, which is what it still has now. But on Facebook Hawkins says the last move was 26...Rd4 and Arkell resigned rather than losing on time. I changed the move on chess24. Overall the live game broadcast (not to mention the commentary...) didn't run that smoothly, although having 32 live boards is impressive compared to similar events. You would have to ask David Howell but I am 99% sure he DID spend about 28 minutes on that crucial 42nd move, unfortunately making the wrong decision as he could have won the R ending after 42 Ke2 to force a play-off. You cannot go by times showing at that Chess24 link because evidently the board and clock display was manually reset by somebody when the boards froze after Black's 38th. 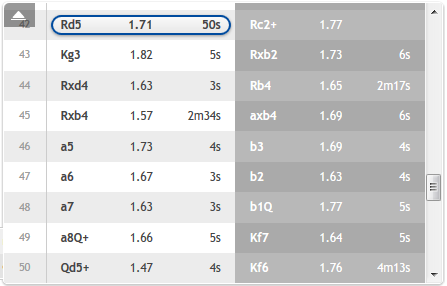 Like many others watching at the time (see comments on the English Chess Forum) we know that Howell was playing on increments coming up to move 40. Eventually the position after Black's 41st appeared but with Howell's clock showing 0.00 whereas time was showing on the direct ECF link. We thought there must have been another freeze but we were wrong. Eventually Howell played the mistaken 42 Rd5 and his time was shown again. They blitzed into the queen ending after which Howell had 2 minutes left and Hebden about 30. Since 30 minutes were added when the original allocation ran out, Howell must have used a lot of time somewhere. Clearly it was at move 42. So a lot of the premise of your post is incorrect, sorry. In general, Chess24 does not seem to be able to handle time added after 40 moves automatically and requires a manual reset (even when DGT boards are working properly) but it usually does show moves, unlike ChessDom's software which refuses to show any more moves after 0.00 comes up, unless somebody resets the software. A more significant last-round moment, perhaps: The live PGN initially had 26...Rd4 as the last move in Hawkins - Arkell. Then a few seconds later it changed to 26...R5d7, which is what it still has now. Yes: like John Saunders I was watching when the rook suddenly slid back to d7. My first thought was that there had been a move input incorrectly earlier and that maybe Keith hadn't played ...Rfd8 after all. But alas this was not so. Quite likely but that's also a problem with the clock running out and not restarting, isn't it? You don't know if the game has frozen or not. Of this I'm aware but the trouble is, once you have games freezing and restarting you don't know whether what you're seeing is live or delayed, and if times are wrong then more than one time could be wrong. Now you might say, well, this might be true any time, because sometimes players take an hour over a move. But the point of the post is that when the IT has been consistently erratic, we can't assume that what we're seeing is what's really happening. "Chess24 does not seem to be able to handle time added after 40 moves automatically and requires a manual reset"
For better or (and) worse it's actually completely automated - but relies on getting the new time from the clock info in the PGN after a move. There is a bug with that meaning that the time taken is often missing on move 41, because actually the software calculates a negative time taken for a move when extra time is added. Maybe that instead happened on move 42 in this case. Despite the extra 30 minutes Howell thought so long he was left with less time after the move, so we show 50 seconds taken, while nothing is shown for Hebden since he gained time. I asked if we could fix that, but the IT guys think it would take too much effort for a 1-move glitch and you wouldn't always be able to specify before a tournament exactly when time is added (sometimes it's added at move 40 and sometimes it's only added when a player's clock gets to 0, if I understood correctly). We're in touch with the DGT software guys about improving their system and they want to do something, but it probably won't happen any time soon. Arbiters have two methods of programming digital clocks to add additional time. One is to count the number of times the clock has been restarted and add the time at the move count. This was the method almost invariably used ten years ago when increments were in use and could well explain why DGT and other software expects this method to be applied. Arbiters have now formed a distrust of players being able to press the clock once and once only for each move and now set the clocks to the confusion mode they had always employed with non-increment timings. That is, that for some arbitrary period after move 40, the clocks will display an incorrect time remaining until one of the players reaches zero. The clock should actually know how it's been programmed and presumably needs to declare this to the move monitoring and display software. Anonymous wrote: "... set the clocks to the confusion mode they had always employed with non-increment timings. That is, that for some arbitrary period after move 40, the clocks will display an incorrect time remaining until one of the players reaches zero." Good one! Had me going there for a minute. Then I remembered this is the internet, not to believe everything I read. If at move 40, the clock declares that there is one minute remaining, it is showing an incorrect time if an extra thirty minutes or whatever is due to be added. It's a familiar effect to those using digital clocks under these circumstances. Players unfamiliar with this quirk, or who have forgotten the move rate can easily get confused, either into panicking and assuming they were living on the increment or expecting additional time and then losing when they were in events NOT adding extra time.